We had family dinner at Aberdeen Court yesterday to celebrate mom and dad's wedding anniversary. Eat all you can rate at only Php203 per person during weekdays and Php135 for kids. Meals served there are not the same as the one in Saisaki or Yakimix. They serve cooked meals with several variants and a dessert. Not too bad for 200+, plus we're not a big eater so it was okay. What I love there was the coffee. 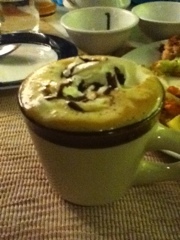 I ordered cafe mocha and it was good! For only Php70. My sister bought flowers for mom and Conti's cake for dad. It was a good family night dinner. Thank you God.